Four hour classroom session, online or blended: Preview the workbook immediately! The interactions that your customer service representatives have with your customers directly reflect the values and personality of your organization. Therefore, their ability to provide quality service is critical. It is essential to ensure that your customer service representatives are building positive, memorable experiences that keep customers returning. Research has shown that the majority of customer experiences with any given organization are neither positive nor negative, and highly forgettable. Neutral and negative experiences are counterproductive in developing the kind of long-term customer relationships a company needs to succeed. The key is to provide a positive customer service experience for your clients that will separate your organization from the competition. 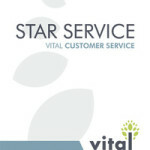 The Vital Learning STAR Service™ course helps customer service representatives improve customer experiences. Service employees will learn the processes and skills necessary to provide customers with positive, memorable experiences. 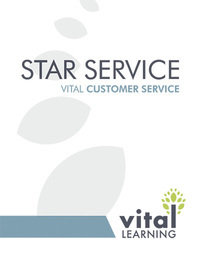 The clear, practical, four-step STAR Service Process™, coupled with the communication skills taught in the course, will show employees how to transform negative and neutral customer experiences into positive and memorable transactions. In addition, the course teaches how to reaffirm and enhance long-term relationships—the foundation of business success. Click on the “e” icon to immediately enroll and begin the STAR Service online course.